Bovada Casino caters exclusively to the American market, so if you’re looking for a reputable casino accepting North American players with payments using USD, look no further. Bovada.lv is one of the most highly trafficked online gambling sites in the USA, offering dedicated casino, sportsbook, horseracing and poker sections. With an alluring welcome bonus of up to US$3000 in bonus money, Bovada is a must try for American punters who want to try their luck on blackjack, roulette, video poker, baccarat, craps or the slots, without having to download any special casino software. What kind of players is Bovada suited to? Casual players? – Bovada’s main offering is the slots, with games available for free play or real money bets starting from just a few cents, making this casino suitable to the more recreational punter. Table game fans? – there are a decent selection of table game variants, including several blackjack variants, but players who are used to the large table catalogue from Microgaming and NetEnt may be a little disappointed in the offering. High rollers? – the maximum deposits allowed are pretty low, so unless you have access to a Bitcoin account high rollers may want to play elsewhere. However, there is a high rollers VIP program called The Red Room, which is accessible via invitation only. Welcome bonus – new players receive up to $3,000 in matched deposit bonuses. Just enter code ‘SLOTS500’ when making a deposit to receive a 100% match up to $500 to use on the slots, or code ‘GAMES250’ to receive a 100% match bonus up to $250 to use on other games. Both reward codes can be used up to four times each for a maximum of $3K in bonus money. Bitcoin welcome bonus – new players who sign up and make a deposit using Bitcoin can claim up to $5000 in matched deposit bonuses. Enter promo code ‘BVCBITCOIN150’ during your first three Bitcoin deposits to get a 50% matched bonus up to $1,500 each time. Refer a friend bonus – if you successfully recommend a friend to sign up with Bovada.lv, you’ll be rewarded with 200% of the value of your friends first real money deposit up to a value of $100. Casino Benefits – this is Bovada’s loyalty rewards program, where you’ll begin earning points for every dollar spent at the casino. For every 100 points you accumulate, you’ll automatically receive $1 of real money credited to your Bovada account. There are all kinds of exclusive casino bonuses available to registered players, like Blackjack Weekends, Table Mania Tuesdays, Reel-It-In Thursdays and more. Check the promotions page at Bovada.lv to see what current promotional offers are up for grabs. Bovada is an instant play casino which requires no downloads to access any of the games. From the homepage you’ll see a list of the upcoming sports betting events – to access the casino games all you need to do is hit the ‘casino’ tab down the left hand side of the screen. 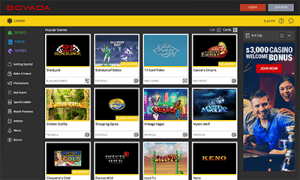 From here you’ll be taken directly to the instant-play casino, where you can scroll through the most popular titles, or select the game category from the selection on the left hand side of the screen. Overall, it’s a fairly easy site to navigate. If you have trouble viewing the browser based site, Bovada recommends clearing your cache and then refreshing the page, which should fix the issue. There is no downloadable app available for Bovada, but you can access a selection of its most popular casino games directly over the browser of your smartphone or tablet. Given the instant-play nature of the mobile site, games are available for all data-enabled mobile devices, including Android, iOS and Windows Phone operating systems. Mobile players who have already registered an account at the desktop site can use the same login details to access the mobile site, will taking advantage of an additional $10 mobile bonus offer. Just sign in on your mobile, wager $250 or more between Monday and Sunday and the bonus is yours. Slots – Bulletproof Babes, Caesar’s Empire, Golden Gorilla, Shopping Spree, Vintage Vegas, Mystic Wolf, Cleopatra’s Gold, Loco 7s, Lions Roar, Dirty Martini, Food Fight, Jackpot Pinatas, Super Diamond Mine, Aztec’s Treasure. Video Poker – Bonus Deuces Wild, Bonus Poker, Double Bonus Poker, Double Double Jackpot Poker, Jacks or Better, Joker Poker, Loose Deuces, Double Double Bonus Poker. Blackjack – Blackjack, Double Deck Blackjack, European Blackjack, Perfect Pairs, Single Deck Blackjack, Zappit Blackjack. Table Games – Baccarat, Caribbean Hold’em, Caribbean Stud Poker, Casino Battle, Craps, European Roulette, Let ‘Em Ride, Pai Gow Poker, Red Dog, American Roulette, Tri Card Poker, Vegas three Card Rummy. Specialty Games – 30 Ball Bingo, 80 Ball Bingo, American Bingo, European Bingo, Itchin’ 2 Win, Keno, Sudoku Box Game. Bovada.lv also offers a separate section for sports betting, horseracing and poker, which you can access using your casino login details, which will appeal to those looking for a broader range of online gambling services. There are no deposit fees on your first deposit or any Bitcoin deposits, however all subsequent Visa deposits will incur a 4.9% processing fee and all MasterCard deposits will incur a 6.9% processing fee. Withdrawals are available via Bitcoin, Rapid Transfer, and Check by Courier only. You can make one withdrawal per month for free, with subsequent withdrawals subject to a US$50 processing fee. Withdrawal request take up to 48 hours to process, and will hit your account instantly or can take up to 15 business days depending on your chosen payment method. Bovada is a 100% licensed and legal online casino catering exclusively to the American market, with a solid reputation for providing good customer service and a variety of casino games available to play for USD. All casino games use verified RNG (random number generated) software, which are audited regularly by iTech Labs. We couldn’t find any information on Bovada.lv about where the site has received its gambling license, however further research has revealed Bovada is licensed by the Kahnawake Gaming Commission, a reputable gambling jurisdiction located in the Mohawk Territory of Canada. There are no live dealer games. The casino doesn’t clearly display its Kahnawake Gaming license, which is something we always look out for when choosing a reputable, safe online casino. There’s no live chat option – although help is available via email or phone support. In the past the casino hosted a much larger variety of table games, which included games by BetSoft, so it’s disappointing these are no longer available. American players are accepted, with deposits using USD, which can be difficult to find. There’s a large selection of slot games, with some high progressive jackpots to be won. The welcome bonus is one of the biggest we’ve seen, plus the casino offers plenty of ongoing bonus offers to keep loyal players interested. Bitcoin payments are available, which is good to see as Bitcoin gambling grows in popularity. Keen to give Bovada Casino a try? American players can sign up and make real money deposits using USD to claim up to $3,000 in welcome bonuses.